Billy Cotton started his musical career playing drums with the Royal Fusiliers when he was just 15 years old. He saw service in the Dardanelles and was given a commission in the Royal Flying Corps at 18. By this time he was playing the drums in small camp bands. When demobilised, he briefly worked at a bus conductor, a butcher's roundsman and a millwright's assistant, supplementing his income by gigging with Gilbert Coombes and his Fifth Avenue Orchestra in Kilburn. He also played football for Brentford. In the early 1920s, one of his first jobs, though still a semi-pro musician, was playing in a trio for 5/- (25p) a night. The other two member of the trio were his nephew. Laurie Johnson (only four years Bill's junior) on violin and Arthur Rosebery on piano. 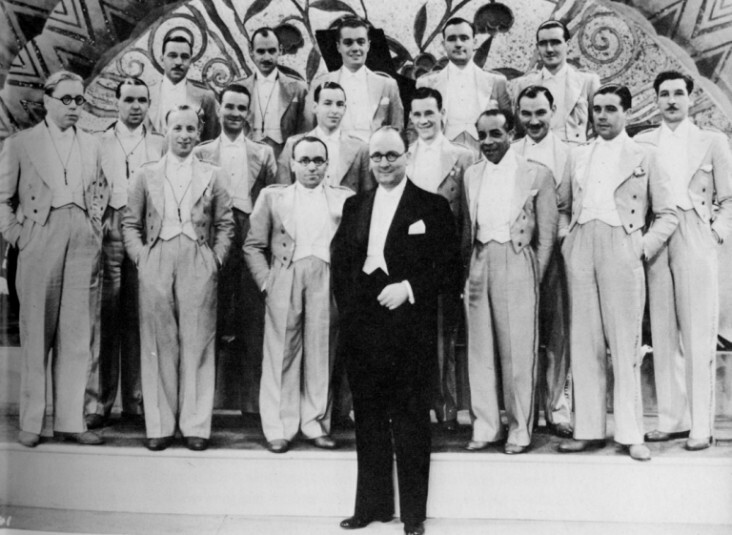 Rosebery went on to become a major bandleader himself, but his story belongs elsewhere. Laurie Johnson, despite being only 18 years old, was something of an impresario and after a spell leading the band at the Ealing Palais, with Bill on drums, for £6 a night, he landed the plum job of providing four bands at the 1924 Wembley Exhibition. Laurie himself led one of these, with Bill on drums, and called it Al Johnson and the San Prado Band. The band also broadcast over 2LO. After the exhibition, Bill went to work for Jack Howard at the Olympia Ballroom. Then he decided to form his own band, which included Laurie on violin and he auditioned for Gaumont-British; this led to a resident position at the Regent Ballroom in Brighton. This was in 1925. 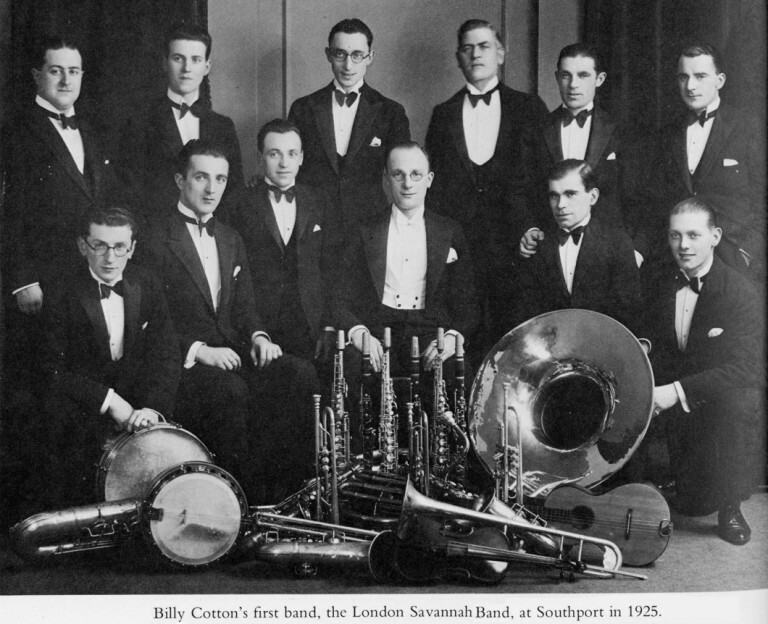 Bill called the band "Billy Cotton and his London Savannah Band", a name he continued using until 1929. Laurie left to form his own band when Bill moved to Southport Palais on May 29th, 1925. 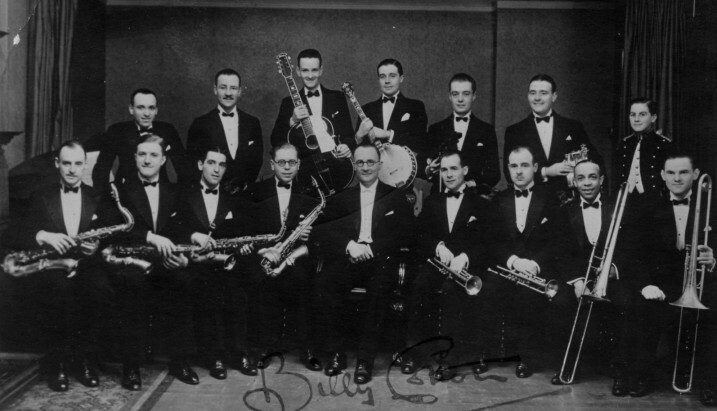 At this time, Bill's musicians included several that were later to become big names, such as Syd Lipton on violin and Joe Ferrie on trombone. They stayed at Southport until 1927. It was here that Bill gradually changed the band from playing purely dance music, to putting on stage acts. The band moved to the Astoria, Charing Cross Road, then on to the Locarno, Streatham. During this period, Bill started his long recording career, making records for Metropole and Piccadilly, plus a solitary disc for Decca. His big break came on moving to Ciro's Club in about 1929, where he stayed until the spring of 1931. For most of the rest of his career, he and his band did stage shows, with his nephew as his "right-hand" man, starting at the Alhambra Theatre in Leicester Square in 1931. He is well-remembered today for the long-running "Billy Cotton Band Show" which was broadcast on radio & television in the 1950s & 1960s, preceeded by his famous call of "Wakey Wakey". In early summer 1931, Bill became quite ill with rheumatic fever and had to stop performing. Obviously, his musicians became restless and left him. The three brass players, Nat Gonella, Sid Buckman & Joe Ferrie, joined Roy Fox's new band, while Syd Lipton left to start his own band. Bill had a knack for spotting good musicians, and, undaunted, re-built the band a few months later, with help from his nephew, who disbanded his own band, so that Bill could have the pick of the musicians. 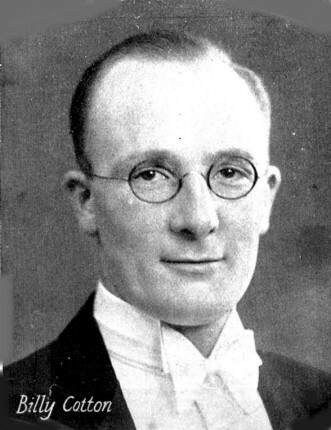 His pianist and arranger for almost his whole career, was Clem Bernard. Many other musicians stayed with Bill for years too, including singer Alan Breeze, who joined in the Spring of 1932 and stayed until the end in 1969, coloured trombonist & dancer, Ellis Jackson and violinist Phil Phillips. Bill had passions other than music. He was a fearless and determined racing driver and actually drove the famous Blue Bird, achieving a speed of 121 mph. and also had his own aeroplane, a Gipsy Moth, which he often flew in the years before World War II. He married Mabel Gregory in 1921. He had two sons, Ted & Bill junior, the latter becoming head of entertainment at the BBC. I mentioned his early recordings above. From 1930 to 1936, he made many records for Columbia, Regal and Regal Zonophone, switching then to Rex until the late 1940s when the label was discontinued. Subsequent records were made for Decca right up until the late 1950s. His best selling record was believed to be "South Of The Border" on Decca (according to Julien Vedey in his book Band Leaders). I first became aware of Billy Cotton though his famed "Billy Cotton Band" series on Radio and Television in the 1960s. It was not my kind of music, then, but when I started collecting 78s in the early 1970s, Bill's Rex and Regal-Zonophone records turned up often. They were usually comedy numbers, so I was very surprised on finding his Regal record of "The Clouds Will Soon Roll By" played straight and showing what an excellent band he had for dancing to. Acknowledgments: Leader of the Band, by Chris Hayes; The Greatest Billy Cotton Band Show by John Maxwell; Band Leaders by Julien Vedey.